Shanti Niketan, the abode of peace, was founded in 1901 by the poet Rabindranath Tagore, who established an open-air school, which are an International University (Visvabharati) and a great centre of oriental education and culture today. Set amidst lush greenery, the University imparts academic and cultural studies together with a wide range of activities like agriculture and cottage industries. The campus grounds also contain sculpture and mural frescoes by modern artists. Paintings of the Bengal school, and folk objects from Java, Cambodia and China can be seen in the Kala Bhavan Museum. 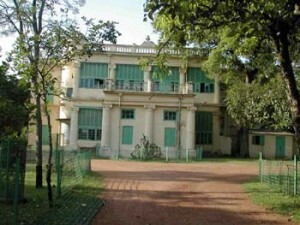 The prime attraction of shantiniketan is the house Uttarayan,where Rabindranath Tagore spent his last years.Coupled with quite a few Bhawans, in Uttarayan’s Bichitra Bhawan, The Rabindra Museum has been set up. Articles are on display along with the Nobel prize won in 1913, numerous other awards,slippers and jobba,pen,dresses,pictures and manuscripts etc are there. This entry was posted in Shanti Niketan, West Bengal. Bookmark the permalink.